We have been using poultry manure as our base fertiliser for many, many years. 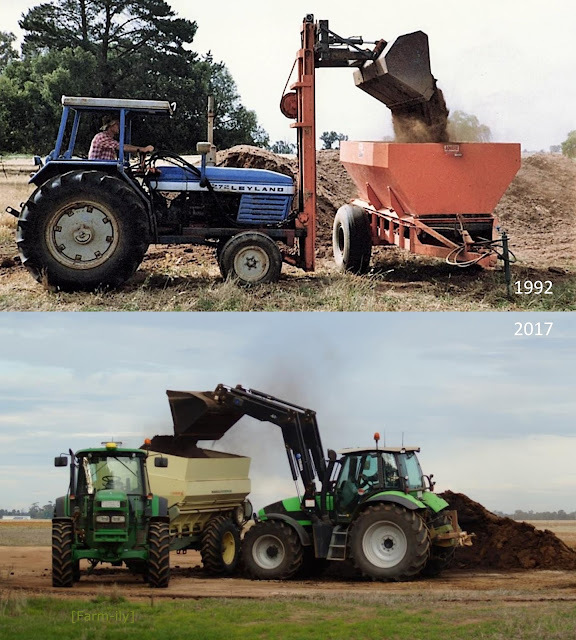 The way we spread hasn’t really changed much over the years... just the machinery. Back then the Leyland was used as both the loader tractor and the tractor that pulled the spreader… without a cab. I bet you are thankful for these changes! What a blast from the past! We used to have a Leyland! My brother won't entertain any thing other than a Massey Ferguson now! I loved this comparison. It's interesting to see how equipment has changed. I would think that the cab is a welcome change for that job! Good to see how far 'things' have come in that time frame.